THE SKINNY: Ultra Collagen is an anti-aging mask made from a powdery, marine collagen. It's meant to provide intense hydration. But this product is a lot of work. It's sold in two parts, the powder and a clear gel that contains vitamins and the binder for the masque. You mix it up. The result is an almost fizzy watery good that you dab onto your face and let dry. It smells awful. Then it hardens on your skin, and it's one of the more uncomfortable masques I've tried because it's so stiff. Once it dries, rinse off with warm water. Luckily, it rinses easily. My skin didn't look or feel that different. It was softer, but it also felt a little greasy. KEEP OR TOSS: Skip this one. It's really expensive to not get real results. 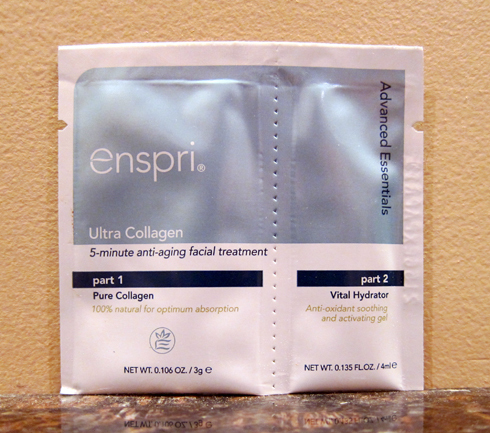 CHECK IT OUT: Fine a full list of ingredients at the Enspri website.